Event Decks: More Information Discovered! 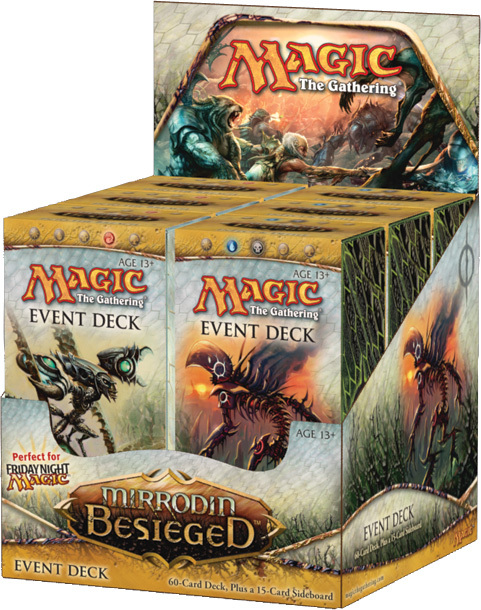 There has been much speculation surrounding the Event Decks which will be released to coincide with the Mirrodin Besieged Game Day, and we are pleased to report that your sleuthing correspondent has learned that the decks will carry an MSRP of $24.95. That there will be two of them is already known… but less so is that this is not a one-time release. That’s right- there will be Event Decks released for New Phyrexia/Mirrodin Pure as well! ALthough undoubtedly more information will come to light in the weeks ahead, that these may well be recurring products has the Lament crew very excited! All right. I’m interested, but what exactly are the event decks? Oh, that’s right. This explains it: http://www.wizards.com/magic/magazine/article.aspx?x=mtg/daily/arcana/521. Yeah, now I just have to figure out if I’m going to the Game Day since I don’t know what that really is. All Game Day is, is a set day a few weeks after a new set comes out which is like a mini tourney for Standard. There’s nothing all that major about it, but they often have novel little giveaways and prizes to hand out for it supplied by Wizards. Seems pricey for a deck. Will have to see what’s in ’em. Otherwise, that better one heck of a life counter. I am under the assumption that since “Intro Decks” have taken a more newbie-friendly track, that Event Decks are the new line that hosts more competitive, focused decks.